Amy Adams plays Anna, a slightly uptight young woman who travels to Ireland to propose to her boyfriend, Jeremy, who is there on business. She has been inspired by an Irish tradition that says a woman can propose to a man on February 29th in a Leap Year. Anna’s plans go awry because of bad weather and she ends up at the other end of the country to Jeremy. She has to enlist the help of a local innkeeper to get her to Dublin in time. Her and Declan (Goode) embark on quite a painful journey together, but by the time they arrive in Dublin, they have fallen in love. What will Anna do? Adams plays a woman who’s in need of saving and that’s not always an endearing character for me. But at least she plays it well and there’s a smitten of humour attached. This is not an outstanding movie, but it’s pretty enjoyable – predictable – but enjoyable. Anna (played by Moore) is the teenage daughter of the US President. It is difficult for her to find a relationship amongst all the security. On a trip to Prague with her parents, she runs off for a bit of unsupervised fun. But her father ensures that her adventure is actually not unsupervised and assigns a very young, suave CIA agent to accompany her. 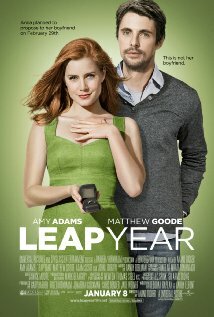 During their trip they develop feelings for each other, until Anna finds out that Ben is actually working for her dad. It’s no secret that I’m not a fan of Mandy Moore – see both attempts at acting in Swinging with the Finkels and Love, Wedding, Marriage. This film from 2004 adds a third to her trifecta. I suppose it didn’t help that the script was slow and frustrating and the bit part acting wasn’t up to par. Moore’s character kept going on and on about not having any freedom (what can you expect!!!) – spoilt brat. AND I’ve backpacked around Europe a few times and guess what – you can’t do it without a passport or any money! Junk junk junk. Mandy Moore has just won top spot as the worst rom com female lead ever. Heck and Rachel are newlyweds (played by Goode and Perabo). But Rachel catches sight of some-one on the wedding day that makes her confused about her feelings. Is there such a thing as love at first sight? Rachel starts pulling away from Heck, the innocent party, who doesn’t know what’s going on. Their relationship quickly goes downhill as Rachel knows she is in love with some-one else and can’t tell Heck. Will Rachel’s feelings for Luce be enough for her to leave Heck? Some parts in this flick were a bit painful, but there is a great romantic ending to look forward to. It is refreshing to have a break from rom com stereotypical heterosexuality and gender roles. Not a bad flick from 2005 with good performances from Headey, and terrific support roles from Head, Imrie, and Johnston.